Just when you thought the BB cream craze had reached its height, the popular flaw-blurring technology has now jumped the aisle into hair care. But what does that mean for your strands? By combining treatment and styling ingredients together in one product in the same way that facial BB creams combine skincare with makeup, you can tackle hair health and texture quickly, thanks to bottles packed with multiple benefits. “It’s similar to what stylists term ‘cocktailing’ different products together in order to apply one customized balm,” says San Diego stylist and salon owner Jet Rhys. However, some of the more sophisticated ingredients in these new high-tech balms are now coming straight from skincare. KeratinPerfect Hair BB 3-in-1 Multi Action Hair Beauty Balm ($28) contains apple stem cell extract to fight hair aging; nano-keratin proteins to strengthen; and oils of argan, apricot kernel and almond to moisturize and add gloss. 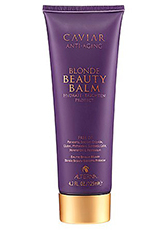 Alterna Caviar Anti-Aging Blonde Beauty Balm ($28) uses vitamin C, lemon, chamomile and honey to hydrate and add body, shine and brilliance to buttery hair colors. The line’s proprietary caviar extract infuses Omega-3 fatty acids into hair to boost elasticity. No word yet on a brunette or redhead version. Other products are claiming a grand-slam list of benefits, of which 10 seems to be the magic number. 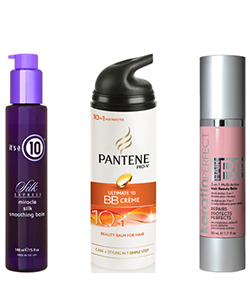 Pantene says when creating the Ultimate 10 BB Crème ($5), the company “looked to the skincare benefits of the BB cream and optimized the right level of ingredients for a product that not only feels good on the hair, but also delivers a flawless finish.” Try this balm for repair, heat protection, frizz control, shine, softening and fly-away-taming benefits, among others. MORE: Are CC Creams Actually Different From BB Creams? And It’s A 10 Hair Care just introduced the leave-in Miracle Silk Smoothing Balm ($20), which claims 10 benefits including straightening, cutting down on drying time, detangling, prolonging your blowout and weightless hair hold, all in one fell swoop. Some may say the BB hair creams are just marketing jazz, but we’re all for anything that saves time, money and space on our ever-crowded bathroom counter. Now, when we see CC Cream for hair, that's when we'll actually fall out of our chairs.